ready to run, hand-built to order, and unlike many mass produced versions we use the correct style lettering, not just the nearest computer font, lettered onto the correct type of wagon. For a modest extra charge, we can also, as a commission, supply R.T.R. 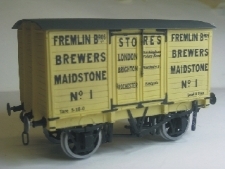 private owner wagons for liveries not already in our catalogue. We have secured a direct line of supply for Slater's 4mm scale private owner wagon parts and having now had our first delivery our dispatch times will soon be returning to normal. We have sufficient parts in stock to be able to supply most of our range for the foreseeable future. (Wagons using Parkside Dundas kits are not affected). 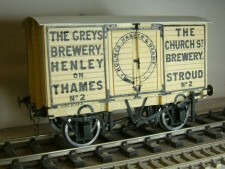 Following the success of our Shepherd Neame vans which sold out very quickly, we are now producing a new '0' Gauge R.T.R. 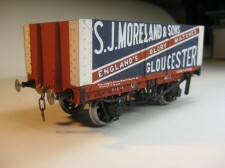 model of the Gloucester C & W beer van. 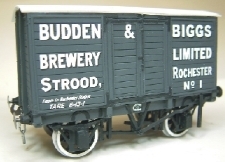 Initially available in the livery of 'Budden & Biggs', Strood, with production being limited to a run of 40 vans, priced at £69.50 each. Ref. no. 0850 'Budden & Biggs'. (They can be found on the P.O. Wagon Liveries/4 page). Where possible we can supply most of our range of transfers already applied to the sides of suitable kits. 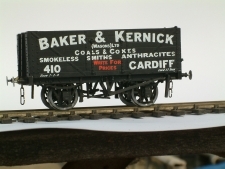 In 4mm scale we use kits by C&L Finescale (Slaters) and Parkside Dundas. All 4mm kits are suppplied without wheels. In 7mm scale we use kits by Slaters and Parkside Dundas, these kits being supplied with finescale wheels. Please note that we do not supply pre-lettered kits in other scales. We have now completed upgrading our website and our complete range is now available to purchase though the site''s secure shopping basket facility. Please refer to the ordering page for further details. In the following pages, we list the various kits and transfers that we produce. Please note that some of the private owner illustrations are computer generated images rather than copies of the original artwork and therefore give a simplified view of the livery concerned. This has been necessary since many of our older transfers were originally drawn by hand, before the days when computers took over! The colours used are only intended to give an approximate indication of the wagon livery. 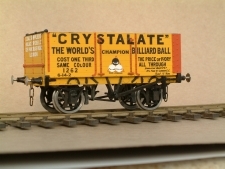 7mm Wagon Kits: Lists the range of etched brass/resin kits that we produce, together with the appropriate transfer packs that can be used with them. P.O. Liveries/1: Lists and illustrates our main range of private owner transfers and pre-lettered kits from #1 - 300. Transfers are usually available from stock, but we produce most pre-lettered kits to order. Please note that this page may take several seconds to load owing to the high level of thumbnail images that it contains. P.O.Liveries/3 and Limited Editions: Lists the range of private owner liveries that we produce as limited edition pre-lettered kits only. These are supplied as numbered kits, produced to a limited run of 50 kits in both 4mm and 7mm scales. Each kit will be withdrawn when its run has been completed. Please note that these liveries are not available as transfer packs. This page also continues our main list of wagon liveries from #651 upwards. Company Packs: Lists our range of transfers for the main railway companies, together with general alphabets and railway and privately owned containers. Our range is continually expanding and to enable us to keep suppling our earlier liveries, we are unable to hold large stocks, therefore most pre-lettered kits and all 7mm ready to run models are produced to order. Whilst we endevour to dispatch orders as quickly as possible, often within a couple of days from receipt, please allow for the following delivery times. We have now changed the Ready to Run page of this site to a photo gallery of 7mm scale models built from our kits. Whilst we do keep a small exhibition stock of R.T.R. wagons for sale, most are bulit to special order and pricing & ordering options can be found in the main part of the site. Delivery is normally 6-8 weeks from the receipt of a confirmed order with either a 50% deposit of card details to which the deposit can be charged, the balance being payable, in both cases, prior to dispatch. Please note that deposits are non-refundable. We regret that we can only accept R.T.R. orders for 7mm scale kits. We offer a commission service to allow individual modellers more choice, and at the same time to expand the overall range available. There is an initial commission charge of £40 for plain lettering and £45 for shaded. Packs of transfers or pre-lettered kits are then available at the normal rates (see ordering page). There is no minimum quantity. Please note that these charges only apply to prototypical liveries of normal wagon size, to a maximum of two colours. Please contact us for work that falls outside of these parameters and we will be pleased to give you a quote. We require either a photograph of dimensioned drawing to enable us to carry out the work. We have a library of reference sources so ofter a book reference is all that is necessary. Delivery is normally 6 - 8 weeks and we require a deposit of 50% of the total cost or credit card details to which the total can be charged on dispatch. Copyright Powsides 2019©. All Rights Reserved.